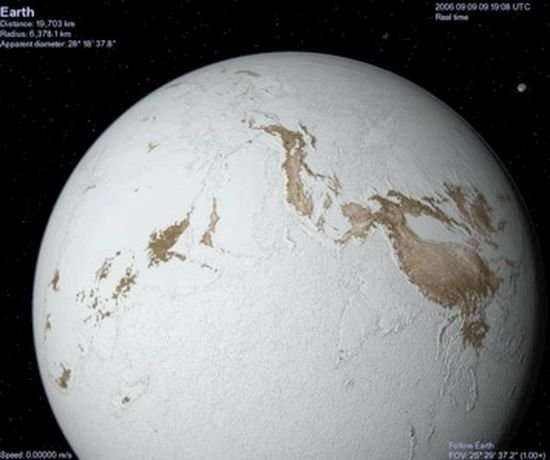 About 700 million years ago, the Earth experienced unusual episodes of global cooling that geologists refer to as "Snowball Earth." Several theories have been proposed to explain what triggered this dramatic cool down, which occurred during a geological era called the Neoproterozoic. Now two geologists at The University of Texas at Dallas and UT Austin suggest that those major climate changes can be linked to one thing: the advent of plate tectonics. The research was published online in December 2017 and in the April print edition of the journal Terra Nova. Plate tectonics is a theory formulated in the late 1960s that states the Earth's crust and upper mantle—a layer called the lithosphere—is broken into moving pieces, or plates. These plates move very slowly—about as fast as your fingernails and hair grow—causing earthquakes, mountain ranges and volcanoes. "Earth is the only body in our solar system known to currently have plate tectonics, where the lithosphere is fragmented like puzzle pieces that move independently," said Dr. Robert Stern, professor of geosciences in UT Dallas' School of Natural Sciences and Mathematics, and co-author of the study, along with Dr. Nathaniel Miller, a research scientist in UT Austin's Jackson School of Geosciences who earned his PhD in geosciences from UT Dallas in 1995. "It is much more common for planets to have an outer solid shell that is not fragmented, which is known as 'single lid tectonics'," Stern said. Geoscientists disagree about when the Earth changed from single lid to plate tectonics, with the plate fragmenting from one plate to two plates and so on to the present global system of seven major and many smaller plates. But Stern highlights geological and theoretical evidence that plate tectonics began between 800 million and 600 million years ago, and has published several articles arguing for this timing. In the new study, Stern and Miller provide new insights by suggesting that the onset of plate tectonics likely initiated the changes on Earth's surface that led to Snowball Earth. They argue that plate tectonics is the event that can explain 22 theories that other scientists have advanced as triggers of the Neoproterozoic Snowball Earth. "We went through the literature and examined all the mechanisms that have been put forward for Snowball Earth," Stern said. "The start of plate tectonics could be responsible for each of these explanations." The onset of plate tectonics should have disturbed the oceans and the atmosphere by redistributing continents, increasing explosive arc volcanism and stimulating mantle plumes, Stern said. "The fact that strong climate and oceanographic effects are observed in the Neoproterozoic time is a powerful supporting argument that this is indeed the time of the transition from single lid to plate tectonics," Stern said. "It's an argument that, to our knowledge, hasn't yet been considered. "In the present day, climate is in the news because we're changing it by putting more carbon dioxide into the atmosphere," Stern said. "But imagine a time when Earth didn't have plate tectonics, and it then evolved to have plate tectonics—that would have been a major shift in the Earth's operating system, and it would have had a huge effect on climate, too." Plate tectonics: What set the Earth's plates in motion? Why is it that a planet that is in the so called 'Goldilocks' zone is considered a contender for life due to that being necessary for liquid water when it's well known that Earth was covered in miles thick ice at times in its past, showing that being in the zone may be necessary but not sufficient. Scientists do not and have not ever argued that the, "Goldilocks' zone" is the only region in which life may exist, but that it is the only region in which planets may maintain liquid water on the surface like Earth. Whether or not said planets are actually habitable doesn't matter as much as far as the definition goes, particularly since Venus and Mars are often described as being within our own Sun's habitable range of orbits! Ice ages happen when the ocean currents to the poles are interrupted. But an ice age is a lot milder than the effects of distance from a star, that is, location in or out of the "Goldilocks zone." How do the authors explain the evidence for supercontinents well before 1000 mya? It is hard to understand how a supercontinent could form and break up without plate tectonics. @Parsec, apparently supercontinents form as a result of mantle plumes which do not require plate tectonics. It's their breakup into continents and movement that require plate tectonics. @Da Schneib - with all due respect, how would one supercontinent break up, the pieces or plates move around and join up into another supercontinent without plate tectonics? After all, that sort of working definition of what plate tectonics is... isn't it? I have a lot of respect for your opinion, most of your comments in this forum are quite spot on. So I am interested in your response. Geoscientists disagree about when the Earth changed from single lid to plate tectonics, with the plate fragmenting from one plate to two plates and so on to the present global system of seven major and many smaller plates. At about 500 million years ago this circular part single lid split up into two halves one is called Laurasia and other was called Gondwanaland.. I don't think it's clear that previous supercontinents were formed or broken up by plate tectonics. If you look closely you'll note that only one continent was changed between 2 billion and 1 billion Ga, and that there was a bunch of activity before 2 Ga. Then there was a bunch of activity after 500 Ma supporting this theory. I think the paper is worth a read if we can get ahold of it. I'll check. The article is open access. Enjoy. Sir, To my mind the earth of land broke into two halves called as Laurasia and Gondwanaland and Mediterranean sea came into formation.At that very time The a mountain range erupted on the bank of Mediterranean which extended right from Gibralter to Bay of Bengal at present. At about 80 crore years ago North America separated from Laurasia. At this very time huge volcanoes erupted on whole land mainly Laurasia created a snow ball effect as you call it. I consider it as ice age.